Fresh lobster feasts and the chance to be among the first people in America to see the sunrise are just a few of the reasons to put the Acadia Byway in Maine on your road-trip radar. The 40-mile route is said to take 4 hours to fully enjoy. But you could easily spend an entire week in the region, basing yourself in Bar Harbor and planning day trips in the form of hikes, scenic drives, rock-climbing adventures and schooner cruises. Designated an All-American Highway by the US Department of Transportation, the Acadia Byway starts at Route 3, just south of Trenton on Maine's North-central coast, where you'll cross the bridge onto Mount Desert Island. The winding route takes in granite peaks, craggy outcroppings, coastal fishing villages and lush old-growth forests as it snakes along the coastline, circumnavigating Acadia National Park (the only national park in America's Northeast) and Cadillac Mountain. Visitors are often surprised by how similarly rugged Maine's coastline is to that of California. But the region has a flavor all its own. About 12 miles southeast of Trenton, you'll reach Bar Harbor -- Desert Island's main village and the gateway to Acadia National Park. Basing yourself here to explore the region is the obvious choice, as there are dining and lodging options for every budget. The crowds swell during the summer months in Bar Harbor, but the town is far from a bustling metropolis. A summer haven for wealthy families such as the Rockefellers, Carnegies and Vanderbilts from the mid-19th century through the 1930s, Bar Harbor retains a village feel today, and all walks are welcome. At the European-style Ledgelawn Inn, which is walking distance to downtown, you can stay in a former dining room-turned-luxury hotel suite where the likes of President William Taft and the Kennedy and Pulitzer families were once entertained. The massive "cottage" dates to 1904 and is surrounded by maple and oak groves, lending a plantation feel to the place. The more modestly priced Bar Harbor Motel, situated on the main road a mile from town and close to the park entrance, has a pool and shady lawn ripe for tossing a Frisbee after a day cooped in the car. Lobster buoys bobbing offshore in Bar Harbor induce crustacean cravings, and the town's scores of restaurants run the gamut from super-sophisticated to down-home casual. Hard-shell lobsters are available year-round. If you're visiting from July to September, ask for soft-shell lobsters, known for their sweeter meat. Stewman's Lobster Pound, on the wharf, calls itself an authentic lobster pound. While the lobsters aren't bobbing off the dock in traditional tanks, they are indeed kept alive and pinchin' in saltwater before hitting the pot. For something quieter, head to Galyn's Restaurant, overlooking the harbor, where classic seafood and steak meals are served in a building that dates to the 1890s. Work off all those garlic butter calories with a stroll around town, taking in Bar Harbor's boutiques, galleries and scenic side streets. Explore the area's Native American history at the Abbe Museum, and pop into the Mount Desert Oceanarium to learn about local lobstering history and see eggs removed from females at the lobster hatchery. Ready to hit the road again? 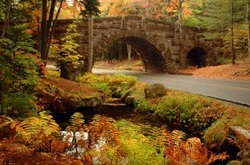 Drive south of Bar Harbor to catch the 27-mile portion of the Acadia Byway called the "Park Loop Road." The heart of the route, it circles eastern Desert Island and Cadillac Mountain while cutting through the national park. Cadillac Mountain is the highest East Coast peak north of Rio de Janeiro, and motivated morning people climb 1,532 feet in utter darkness to be the first folks to see the sunrise in the United States (a title that's only applicable from late fall to early spring). About 20 minutes from Bar Harbor you'll find Jordan Pond. Formed by a glacier, this pristine pool mirrors the surrounding mountains like one of those too-perfect-to-be-real oil paintings. The Jordan Pond House restaurant is the stuff of local lore. Founded as an eatery in the early 1870s, it was later purchased by John D. Rockefeller, Jr. and donated to the park service. In particular, the restaurant is famed for its popovers and afternoon tea. Due south are the Wildwood Stables, where you can take a horse-drawn carriage tour along the park's famous carriage roads. Another Rockefeller gift, the roads encompass more than 50 miles of gravel pathways and granite bridges in Acadia National Park that are closed to vehicle traffic, luring walkers, hikers, bikers and even cross-country skiers in the winter months. As you loop back north toward Bar Harbor, pull off at Otter Cliffs. The pink-granite precipice towers 110 feet above the pounding breakers, offering what are arguably East Coast America's most impressive ocean views. The spot is near and dear to rock climbers, who come from around the world to belay in the unique sea-cliff surrounds. Continuing north, listen for the coastal clap at Thunder Hole. Here, a narrow granite cavern traps air that is emitted with a sound resembling a loud bang of thunder as high-tide waters rush in. Seawater often shoots as high as 40 feet, so keep a distance if you want to stay dry. A perfect picnic spot awaits just north at Sand Beach, where crushed shells line the crescent shore. Brave souls take to the water; barely topping 55 degrees in the summer months, it's hardly inviting. As rewarding of a road trip as the Acadia Byway is, consider parking your wheels for an afternoon and taking to the sea for an entirely different view of Desert Island. From a boat in Frenchman Bay, the sight of the park's granite headlands give credence to French explorer Samuel Champlain's original name for Desert Island: Islands of the Barren Mountains. Several ranger-led cruises can be booked at the park's visitors center. Lastly, a fun activity for families is the Dive-In Theater Boat Cruise, which lets you watch video of a scuba diver scouring the ocean floor as you cruise some of America's most spectacular coastline.